Albufeira is now far from the poor image it once had as a fishing village devastated by earthquakes and that is mostly because of the tourist boom to the resort. It is the most popular resort of Portugal, visited by thousands of tourists every year. You’d love the golden beaches here as well as the sandy coves which are very appealing. 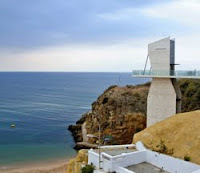 If you are in Albufeira than have a walk on the beach from The Fisherman's Beach to Oura. You will surely enjoy the sunset, the ocean and the rocky scenery. Albufeira has a lot to offer and you’ll surely find something to enjoy here even if you are a single traveller or on a family holiday. The Old Town of Albufeira retains its old charm with slim cobbled streets and old buildings and squares. On many houses you will find painted ceramic tiles with the name of the family living there, so a house facade like a bathroom wall should not take you by surprise in the Old Town. Street or square names are also painted on ceramic tiles. You will also find some modern buildings like hotels with swimming pools or commercial centres (note also the escalator or the lift, pictured, which will take you to The Fisherman's Beach if you want to avoid the traditional stairs). For an active nightlife check out “The Strip” and you’ll party the night away with different clubs, bars, café’s and restaurants. It’s not just for the young crowd; old crowd can also visit the Strip and have some fun while enjoying dinner and live music. While in Albufeira you should try the local cataplana, chicken piri-piri or bacalhau (fried cod) with a glass of green wine (the menu says it's green, but actually it looks like white wine). If you are not happy with the local food you always have the alternative of an English breakfast or fish and chips lunch.